The moisturizing spritz is ideal for those with fine hair or those who prefer a lighter alternative to thick butters. Additionally, it may be used to revive twists or another style that has gotten dry over time. Below are a couple of quick, easy recipes. Feel free to tweak to your own liking! NOTE: Some of these spritzes have a short shelf life (few days to a few weeks), so be sure not to create too much in one sitting. Refrigeration may extend the shelf life a bit. I never tried adding conditoner to a spritz before. Hmmm... I did experiment with glycerin and oils in spritzes. My hair dosen't like glycerin and the oils made my hair greasy. My spritz contains water, aloe vera gel and a tiny bit of honey. It's very moisturizing and smells good. Also, it provides a bit of hold (due to the honey) so when I tie my hair down with a satin scarf I have a smooth finish. Hey, how do you know when ur spritz has gone bad? Does it change colour? @Karlene: My spritz mix has never gone bad. I use the mix I mentioned above. The aloe vera gel I use (Lily of the Dessert) has preservatives so I think that's enough to keep my mix from spoiling. Also, It never last very long so it doesn't have the chance to spoil. I would recommend making small batches and smelling the spritz mix before you use it. If something smells off--it's probably spoiled. @Karlene: Agree with mangomadness. The spritz will start to smell bad if it's gone bad. It usually won't change color until well after it's gone bad. Ok, thanks...for the record, the spritz i use is water, glycerine and peppermint oil or doo gro's leave in growth treatment with a few drops of peppermint or wild growth oil...i never got a bad smell (prolly cuz of the p/mint) but to me it got cloudy...will try ur solutions and refrigerator storage! Tea tree and rosemary are perservatives so if your worried about your mixture spoiling just use these two as some of the essential oils you tend to use. You only need 2drops each plus whatever you are already going to use. 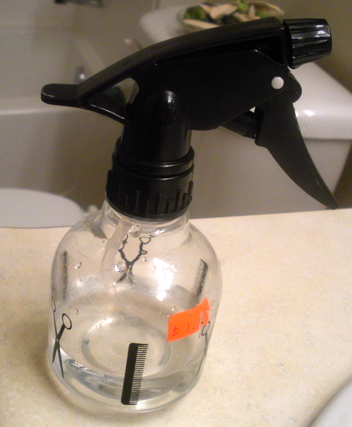 I use Jamaican mango and lime spray as my spritz it kind helps with my itchy scalp. I have box braids and I feel like this works but my question is, is there any diy spritz mix for itchy scalp that may also grow your hair???? Can this be used on braids as well? The Leave In spritz, im assuming its a leave in conditioner used and not one that has to be washed out or does it matter?? I have Senegalese twists and I wanted to know if mixing water, tea tree oil and glycerin would it be ok for itching and dryness. I'm 100% natural and my hair can get EXTREMELY dry and I would hate for my hair to begin breaking off.